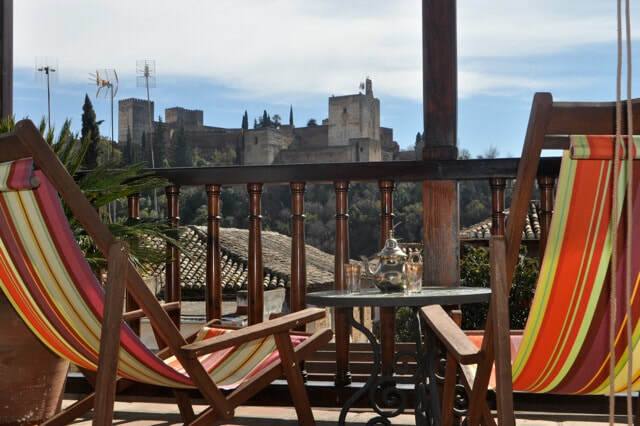 Charming traditional 3 bedroom townhouse in the historic Albayzin area of Granada with spectacular views of the Alhambra. The house is a short walk to the centre of the Granada and the vibrant heart of the Albayzin quarter. Forget cars and walk everywhere from the house: to historical sites but also to schools, university, tapas bars, fresh food market and shops. This home is spread across three floors and consists of 3 bedrooms (one on each floor with two single beds and two with double beds). The Kitchen and dining room are located on the middle floor and open onto the main outdoor terrace with views. The top floor has a sitting area, main bedroom and a deck with views. The bathroom and 2 toilets are located on the ground floor. There is A/C in the top floor lounge area. There is a washing machine and dryer. €1,150 per month plus bills.